I hope everyone is enjoying the last day of their Thanksgiving weekend. I had a wonderful weekend with my husband's family in New York, and we took the kids to see the Muppets movie last night. All that and I still have a day left. I often struggle with going away for the weekends, because I miss sewing time. A lot of weeks, the only time I get to sew is on the weekend. I haven't been a big hand sewer in a long time, and I find that with embroidery, I can only take it with me if it' already started and I know what I'm doing. I can't start a project away from home. Weird, I know, but true. 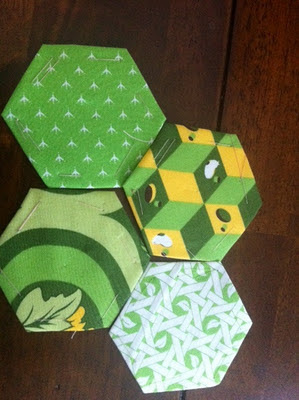 One of the things I've been dying to try is making hexagons. I had gotten some pre-cut paper forms this summer (because I am too lazy to cut my own) and they've been calling to me to use them. I for the life of me, couldn't figure out how to tack down the sides once I cut the fabric. I had to go onto Youtube and look at a video of a 9 year old girl making hexis to understand...you have to baste THROUGH the paper. I was trying to avoid the paper, forgetting I would be pulling out the basting stitches, and would be able to pull the paper out. Can you say DUH? Once, I got going...I LOVED it. Making these absolutely feeds my need for immediate gratification. I already have a bunch more cut and ready to make the next time I have to sit still somewhere. Yesterday, once I got home and SOME of the laundry done, I made some napkins for my etsy shop. I didn't want this fantastic Christmas print to not make it to the shop before the holidays. and I had a few scraps left from a remnant I bought at a Sis Boom sale last year. If you live anywhere near here, and you can get to one of Jennifer's sales, I strongly suggest you do. She has one coming up next weekend. What do you all take with you for sewing when you travel? Little kids surprise me with their skillz sometimes ya know! Your hexies are wonderful--enjooooooooooooooooy! Haha! I can't start a project away from home, either. 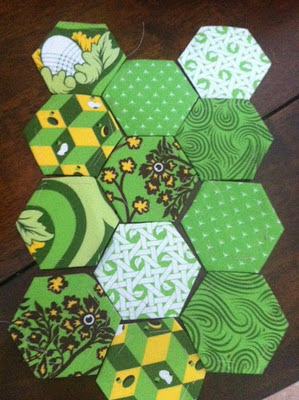 Hexies are a great take-along project. I have those ... and yo-yos ... and embroidery ... and knitting ... and and and. Never leave home without something.